Dear Readers. Shaun Lehmann, Katherine Firth (of the Research Voodoo blog) and I are currently in the process of writing a new book for Open University Press called ‘Writing Trouble’. ‘Writing Trouble’ will help you diagnose and treat your thesis writing problems. The proposed book evolved out of our work on the Thesis Bootcamp program, a writing intervention originally designed by Peta Freestone and Liam Connell. Over the years all of us have been running our own bootcamps we have met hundreds of students struggling to put their final thesis draft together. These students have supervisors who are clearly great researchers, but cannot give good feedback on writing. The book works backwards from the confusing feedback students have showed us. Part of our process with this new book is to test out some of our text on our audience – you. Here is part of another chapter from our section “Where’s your discussion section?” where we deal with the purpose of the conventional ‘bits’ of a thesis and how to treat them. This piece of writing on indexing relates to a previous piece I wrote on the Whisperer about how to do a glossary. It’s the first draft, so your feedback is appreciated! If you’d like to know more about the book before it’s published, you can sign up for our writing trouble mailing list. The index is the elder sibling of the glossary, who has grown up, moved to the big city and started doing drugs. Anyone who has been asked to write one will tremble a little in their boots, at least the first time. 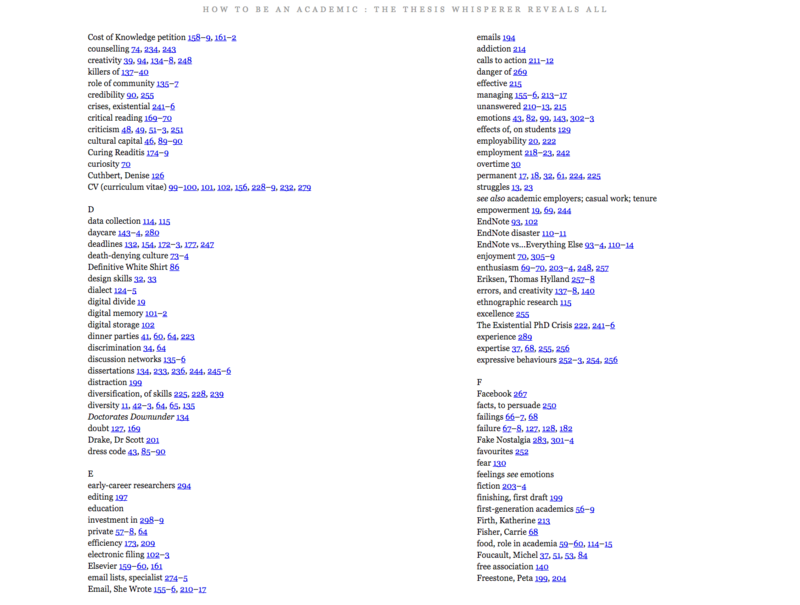 Basically, an index is a quick look up list of terms that appear in your dissertation or book. In a similar way to the glossary, an index serves a rhetorical as well as a communicative role by throwing a spotlight on the parts of your book that will be most interesting and useful to the reader. Indexing is an even more labourious process than making a glossary, but the return on investment is definitely worth it. Beyond the academic examination context, a good index is a vital tool in convincing a reader whether or not to read (or buy) your book. How often have you flipped to the index of the book to see if there’s enough on the topic you are interested in to warrant the effort? That’s right – almost every time. Until this book, only Inger had experience of writing an index and she did a pretty horrible job of it. Here is what she learned. To begin, you need to think about why a reader might want to buy or read your book in the first place. You are not writing a novel, so being practical is not a bad place to start. As a thought exercise, try to think about the kind of problems that your readers are looking to solve. Think of words or phrases to represent these problems and you have a rough list of themes. Inger’s previous book “How to be an academic” was a practical guide to surviving in academia, especially if you are a precariously employed academic. She started by generating a list of things like “making money”, “dealing with assholes”, “writing quickly” and so on. She then tried to think about the themes she thought were important, to give the index reader a sense of the broad range of topics in the book. This generated terms like “networking”. These themes guided the next step: identifying the areas of text where these themes were discussed. The next step is the absolute worst part of the whole process, so prepare yourself. To get to a list-y looking thing, one must read a text that one is incredibly sick of reading by now with a forensic eye. The purpose of this step is to take note of the various manifestations of your themes in the book and make a note of their location. DO NOT DO THIS STEP UNTIL YOU HAVE PRINTER READY TEXT OR YOUR PAGE NUMBERS WILL BE WRONG. At a certain point in making this list, Inger gave up trying to keep it tidy and started using Nvivo, a text analysis software. This worked well, but she doesn’t recommend using this software unless you have the skills; there’s a big learning curve and you have a book to deliver. When Inger’s publisher got this index, carefully compiled over a couple of weekends, she smiled kindly, thanked Inger for the effort and gave it straight to a professional. When it came back, it looked completely different. In Inger’s version, dinner parties appeared under the theme of ‘academic’: a vague sort of category, in the final version it appeared under D, you know – for dinner party. The lesson? When you are generating an alphabetical list, it’s best to bear in mind the alphabet. Inger was close, she just needed to throw away the themes and arrange the list of key words in alphabetical order. The final touch would be to try to think of words that are related to each other and put “see also” under them. Job done, no drugs necessary. Except, maybe – coffee. This is how I did an index, but I’m sure there are more elegant and sophisticated techniques. Have you ever done one? Do you have tricks to share? Love to hear about them in the comments! Sign up for the ‘writing trouble’ book news mailing list. This entry was posted in On Writing and tagged indexing. Bookmark the permalink. It really feels like a natural language AI (artificial intelligence) should be up to this task by now, since a large part of it is identifying themes. The output wouldn’t have to be perfect to be useful. Is there any software that does this? The new product from Nvivo “Interpris” might be able to do a first pass machine learning analysis – in my experience it’s pretty amazing, but would need to be guided. AI with ‘human in the loop’ is definitely the future of this kind of task (but at the moment, very expensive): https://www.google.com.au/url?sa=t&rct=j&q=&esrc=s&source=web&cd=1&cad=rja&uact=8&ved=0ahUKEwilo8WN5LDaAhWLxLwKHfBBDTIQFggpMAA&url=https%3A%2F%2Fwww.qsrinternational.com%2Finterpris%2Fhome&usg=AOvVaw1NVzy8c5clZIW-1uuL8thL I might try to use it for my next book and report back. Thanks Inger – first guidelines I’ve read on writing an index, so clearly there’s a need. Although I must say my first reaction was to cross all my fingers and toes that I don’t need to do one soon. One base ration – your final index includes a number of people, but you don’t mention how to decide who to include in your text. Aurocorrect!!!! ‘Base ration’ was meant to be observation. Could not agree more! A professional made all the difference, but expensive. Thank you for the shout-out to professional indexers! I am an indexer and PhD student, and reading your post just made my day! I second Ying-Hsang’s comment that ANZSI is a good place to start if you are looking for an indexer. Doing a comprehensive Index is possible using good ol’ fashioned Microsoft Word under the References tab. This is what I did: 1. All chapters were sub-documents of a Master document (Google: ‘Understanding master and sub documents) — so I could work on content for all separately without opening the entire book. 2. When I was finished writing and editing the content and ready to do the Index I compiled all chapters as a single book , so that the Indexing function could roam across the entire manuscript. 3. I started with authors, e.g., Jones, A., Smith, H. etc. 4. I then worked on discipline-specific technical terminology. 5. The last thing I did was pick out themes. This was the hardest as all instances of a word need not refer to a theme necessarily; it might be merely mentioning a term in passing, with no thematic relevance at all. The use of “select” and “select all” in Index is to be used with caution. 6. Then I added sub-index entries to go under terms with a wider ambit. 7. The last thing I did was to add “see” and “see also” to terms which are indexed elsewhere, or indexed more thoroughly under another index term. Yes, it is a specialised skill and had I the funds I surely would have paid someone. But, on the other hand, I didn’t do a bad job of it and I taught myself something.